Home »General Life»When does the Moon Rise? There’s an Android App for that! When does the Moon Rise? There’s an Android App for that! Did you see my articles this week on the Perigee Moon? (taking the photo, enhancing the photo with Topaz Detail) There were several reports on the web talking about the super moon, but I could not find any specifi reference indicating exactly when it would happen. 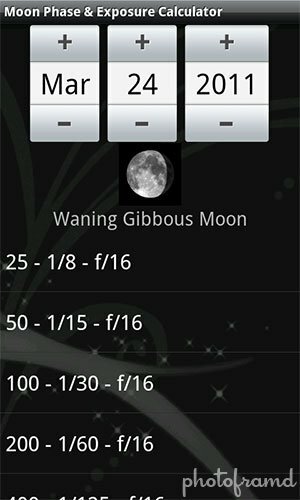 Thankfully, there are several Android Apps that calculate moon rise and set, as well as other things. 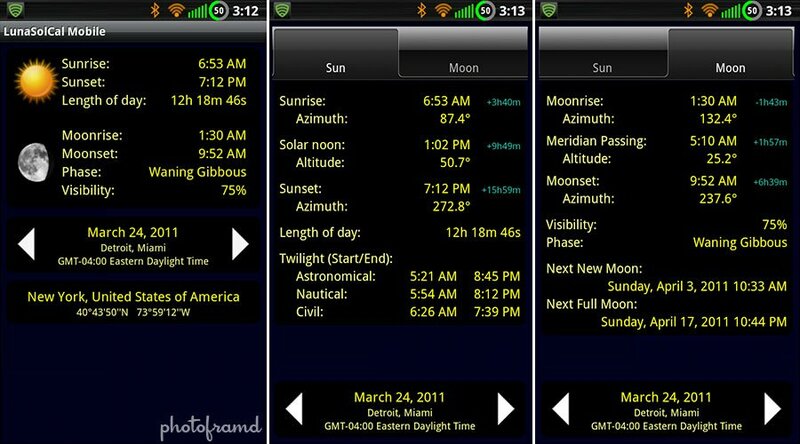 LunaSolCal by Volker Voecking Software Engineering is a free App in the Android Market. It works with GPS to determine your location for accurate information or you can manually set the location (if your GPS is not working). It includes an incredible amount of info for a free App. 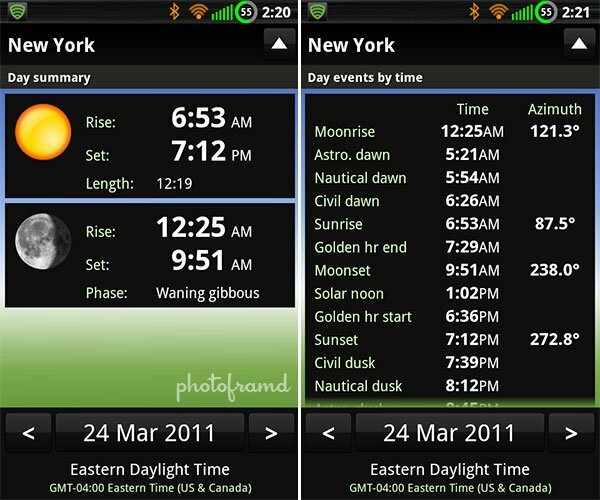 Sundroid by Seneca Internet Applications is also in the Android Market and it is available in both a free and paid version. The free version is limited, but the paid version includes extra info like Golden Hour start and ending. If you like to shoot during this time, than the App may be worthwhile. Photo Tools by HCPL is another free App in the Android Market. This App is truly designed for the photographer! For moon shots, it includes suggested ISO/shutter/f-stop combinations. In fact, I used the suggested settings for my shot with the Canon 7D & the 100-400mmL lens. This App includes plenty of relevant info like calculators for depth of field, flash exposure and hyperfocus. It even includes a built-in graycard function as well as a color wheel. You really have to love the support in the Android Community. There are so many Apps available, many of which are free. It makes it very easy to have to have the perfect reference in the palm of your hand. Even many of the top selling iPhone Apps are making their way into the Android Community. Have you seen iBird Pro yet? If you like to take pictures of birds, you have to see this App too!